This week’s quad one came down to FM Leif Pressman and NM Daniel Lowinger who both won their first two games. Their game was eventually drawn and they shared first place with 2.5/3. 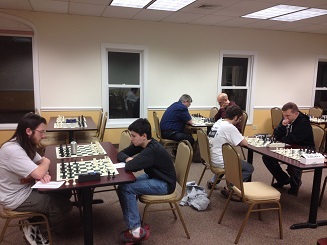 Michael Bogaty was the star of the second section, a six player swiss, winning sole first place with 2.5/3. Michael Amori and Daniel Cooper tied for second with 2/3 each.